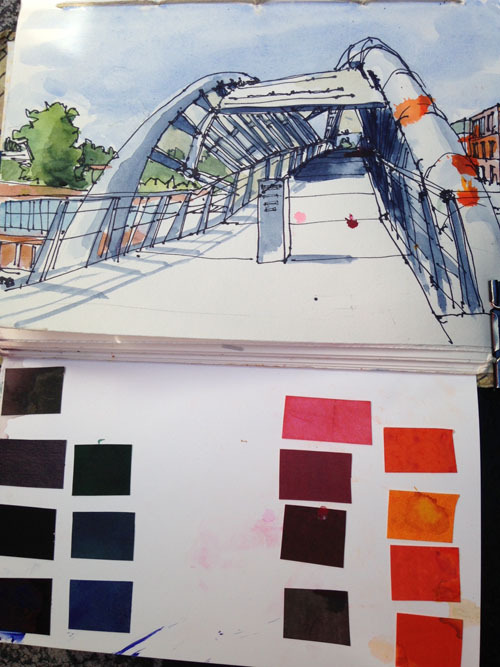 This was my second time to the Amgen Helix Pedestrian Bridge, the first being a few years ago when urban sketchers had an outing there. I didn't fully appreciate the significance of the structure till Kate's post prodded me to do a bit of research. I love that it's designed to call to mind DNA's double helix. 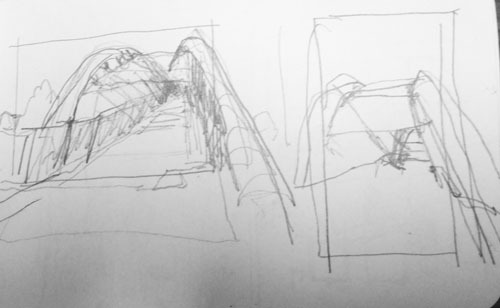 The whole complex, bridge included is a powerful site that is much overlooked because of it's location. I love the view of the bridge when you get to the top of the stairs coming up from Elliot, so I just plopped myself near Kate and Susan and dove in. See the red, orange and pink blotches? They were a happy accident. 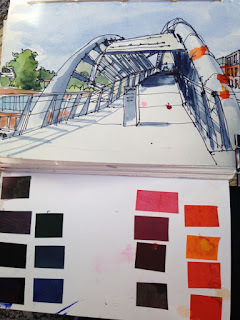 The sketchbook I used has ready-to-use paint swatches on the inside cover. Unwittingly I folded the palate inside to keep the wet paint from bleeding on the previous page. When I open it up, voila! Color spots! This small piece I squeezed in right before we met up . I liked the shape of the tower next to the bridge and deck. 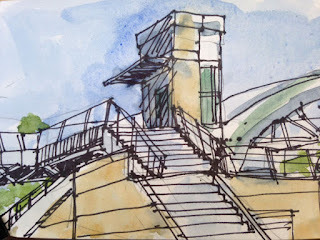 I've gotten into doing more thumbnails since going to a great workshop in Chicago, so I included thumbs of the bridge. Very fast. Very little detail.